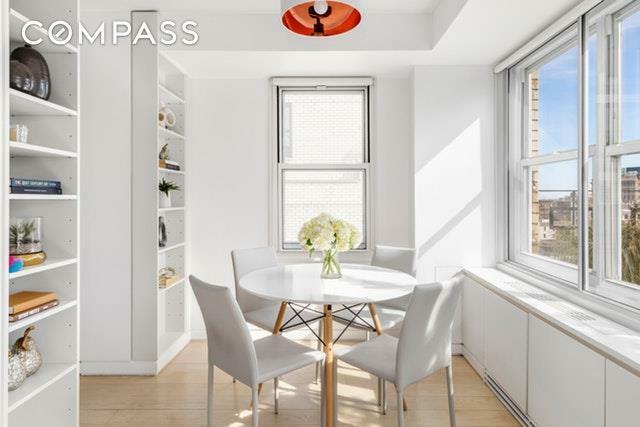 Graciously perched high over Fifth Avenue on the 20th floor, this meticulous and beautifully renovated, 2 Bedroom 2.5 Bath home faces south and east and enjoys sunlight from dawn until dusk. With a wonderful private terrace off the living room and ideally located close to everything this sunny, spacious, warm and happy home is the one you have been looking for!Greeting you as you open the door is a foyer with two spacious, yet discrete, walk-in closets and a stylish powder room. 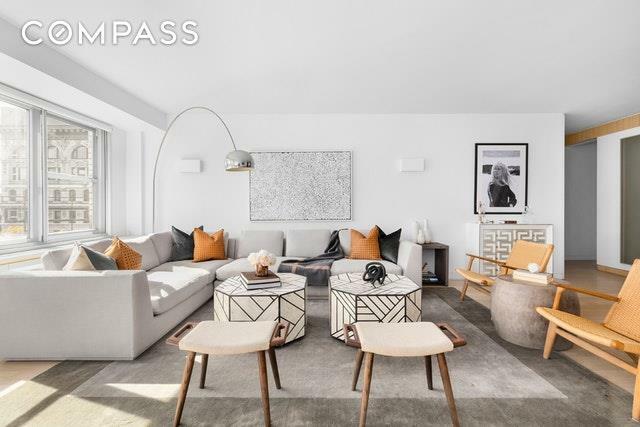 The expansive 25' living room leads onto a private, planted terrace with breathtaking views of the Village and Manhattan skyline. The windowed, corner dining area--complete with built-in shelving--is perfectly situated adjacent to the sleek and modern, windowed kitchen, which features custom white cabinetry and elegant high-end appliances, including a Bertazzoni range and subzero fridge.Down the corridor, and beyond the tasteful washer/dryer closet, is the serene bedroom wing. The large and sophisticated, expertly-crafted Master Suite features two custom walk-in closets and an elegant, spa-like master bath, with pristine white tiles, and a soaking tub--making this both a paradigm of functionality and a consummate retreat. The second bedroom is also large, with ample storage, and bathroom conveniently situated across the hall. Impeccably located on Fifth Avenue; one block from Union Square and transportation; a lovely stroll to Washington Square Park; and surrounded by some of the best shopping, restaurants, and cafes; The Wedgewood House is a coveted and established, full service co-op offering a full-time doorman, live-in super, laundry room, storage, bicycle room, an exquisitely landscaped roof garden with dynamic downtown views and an onsite garage accessible from within the building. 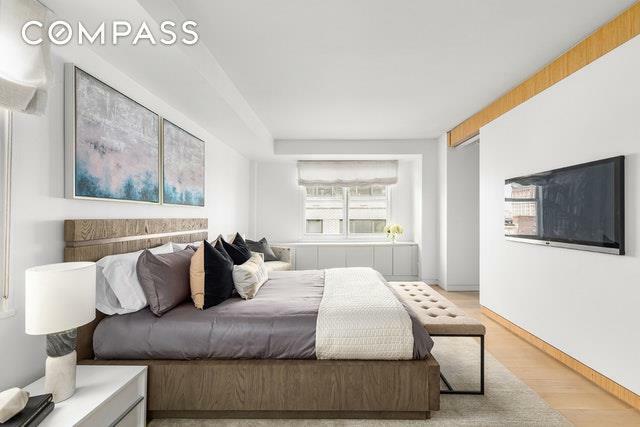 Crisp and immaculate, with striking views, maximized for storage, and complete with modern touches of wood-work and pocket doors, this is the epitome of downtown living! 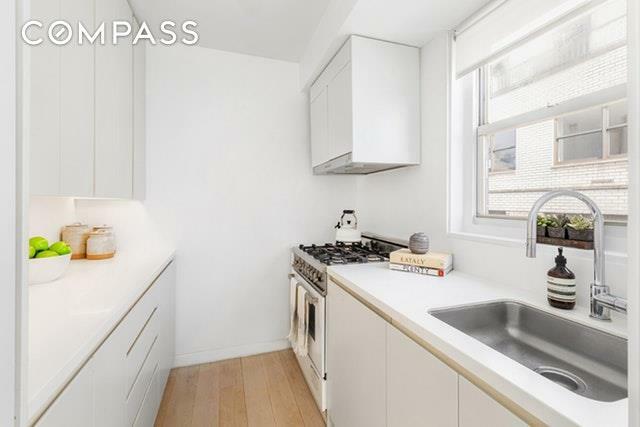 Listing courtesy of Mark Jovanovic of Compass.